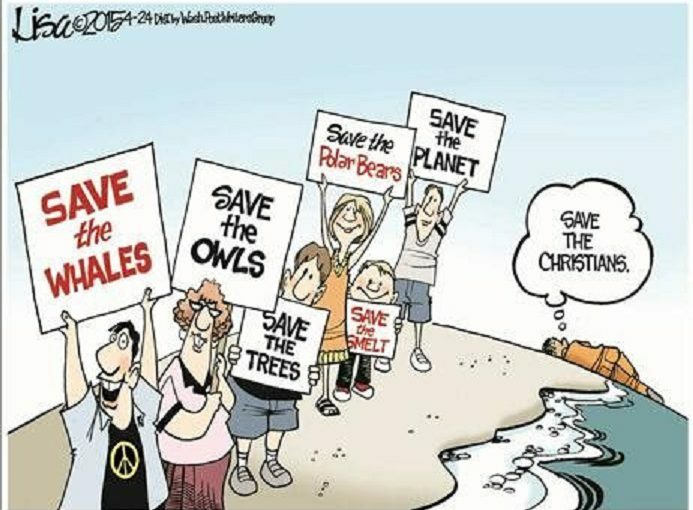 I recently saw a post on Facebook of a cartoon, it depicted a handful of protesters/activists/whatever holding up signs saying save this species or save that species or save this other species, while basically lamenting that no one was interested in saving the Christians. This is just one example of many with this same theme, the Endangered Christian. Okay, here’s the thing… Christians are NOT an endangered species. There are nearly two and a half billion (that’s “billion” with a “B”) of them on the planet. There are more Christians than any other flavor of human. BY FAR. If you are Christian, you don’t get to play the oppressed minority. You ARE the majority. You ARE the culture. You ARE the dominant force in our society. You’ve won. Need proof? Look at your money. The single most important non-religious artifact in our society, and you get to stamp the name of your God all over it. And speaking of money, we let you operate multi-billion (that’s “billion”, with a “B”) dollar industries, doing pretty much whatever you want, unregulated and TAX FREE. No one else gets that deal. No one. Look, just because we may occasionally stop you from forcing some of your more onerous Christian beliefs on the rest of us, that does not mean that you’re endangered. No one needs to save you from the brink of extinction. If anything, we need saving FROM Christians. Too many Christians just aren’t happy unless their spreading their Christianness all over the rest of us, whether we want it or not. God, please save us from the Christians who are attempting to save us. Seriously, you are free to do anything you like. Whatever your God requires of you, do it. But you are NOT free to require the same from the rest of us. You decide what’s right for you. Not for me. Just you. Your rights end where my life begins. This is not oppression. This is freedom. Thank God for freedom! Previous Previous post: Washington Redskins, Offensive?